Bussiness card size. Holds up to two credit cards. Eight digit display. 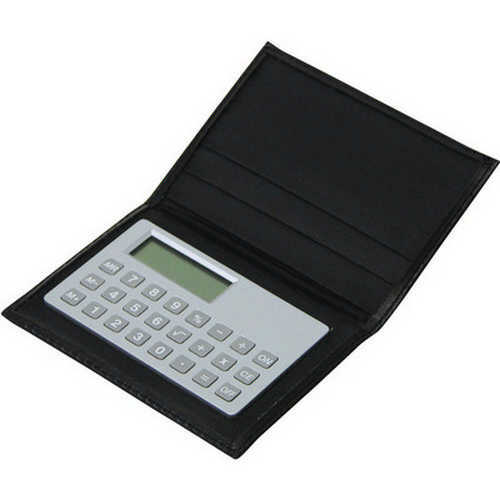 Calculator with easy to use keys. Packed in sopft touch PU wallet . Product Size: 95 x 70mm. Product Packing: Boxed. Decoration Size: Case 65 x 40mm, Calculator 25 x 10mm. Decoration Position: Front of wallet. Decoration Method: Pad Print. Carton Quantities: 200. Carton Size: 35 x 31 x 27. Carton Weight: 11. Colour: Black/Silver. Price includes : Pad Print 1 Colour / 1 Position. Setup is included.